June 5, 2017 By Morgan M Woods Leave a Comment This post may contain affiliate links. 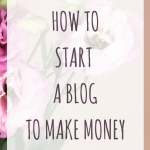 You may be considering starting a blog, or you may not really know what a blog is (I didn’t know either a month before I started one) but you’ve heard you can make money from one. 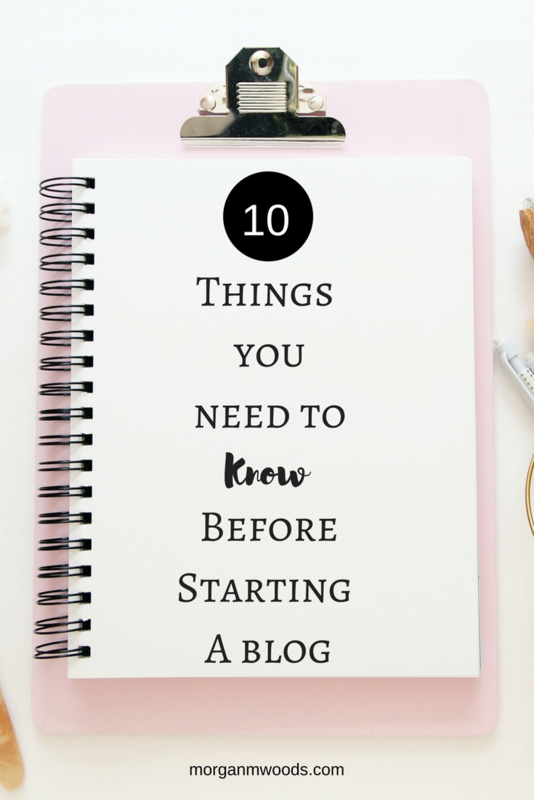 Either way, here are 10 things you need to know before starting a blog. There are some things you need to know before starting a blog. First off you’ll need to pick a topic you naturally want to talk about and love. You need to write a lot of content, so if you pick something you naturally talk about anyway it will be so much easier. I think sometimes there’s a worry that certain topics won’t do so well but pretty much any blog topic can become a success. If you’ve chosen something you love you’re going to look forward to writing and working on your blog. Blogging isn’t just about writing awesome posts, you also need some awesome graphics. When I first started blogging I had no idea how to make graphics! They looked awful! I’ve since taken the time to learn how to make them look nice. The best part is they don’t even need to cost you anything! I recommend Canva to design your graphics and getting some free stock images from places such as Haute chocolate or Wonderlass. You’re writing your awesome content and you’ve got your awesome graphics, now you just sit back and wait for thousands of readers to read your blog? right? Well, no! Now you need to get your blog out there, social media can definitely help but this isn’t going to be an overnight thing. It takes dedication, patience and so much work in the early days. But it will be so so worth it! There will be times when you start writing and totally doubt yourself, do I know enough to write about this subject? I’m not even qualified? Do people really want to read this?? But you need to write it anyway! Making mistakes is the only way we can improve and learn what our readers want. Like blogging, I also had no idea what Pinterest was. I soon came to realise it’s like a bloggers best friend, it’s not just another social media! It’s like a search engine and people are searching for the things you write about, it has the highest sales conversion of any other social media site. A business Pinterest account is a must, it’s absolutely free and full of really useful stuff to help you grow your blog. If you want to skyrocket your Pinterest game then Pin to Profits is the course for you! This was the course that sent my monthly views through the roof. Social media is a great way to spread your posts and get your blog out there, but you don’t need to be on there all day. You can easily schedule your Facebook, Twitter and Instagram posts through Smarterqueue, I love that you can set it up and it just automates your posts. For Pinterest I use Tailwind (this link will give you $15 off) to schedule all of my pins for days at a time. I also use BoardBooster to schedule pins to group boards. This was a worry for me because I’m really not very good with tech stuff, so the thought of building my own site was nerve-wracking! But I’ve found it all pretty much self-explanatory with the help of Google & other bloggers out there willing to help. So you really don’t need to be tech minded to run a blog, you can learn as you go along. To help build my blog I invested in this course called Turn your dreams into money it goes through everything you need to know. 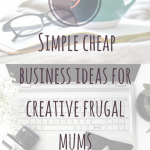 From setting up and starting out, to making money from your blog and so many more hints and tips in between. You can start a blog for absolutely nothing with a free WordPress site, but if you’re considering monetising your blog its worth spending some money. You need your own domain and hosting, but this doesn’t have to cost a lot. I use and recommend Tsohost (10% off when you use the code Morganmwoods.com), I’m on the pro hosting plan at £49.99 per year which included my domain for free. They are super quick to sort out any issues & took the time to help me set up my website when I needed it. You can then easily install wordpress onto your site and start blogging. You might think that we just sit at home on our own all day. I suppose this is kind of true but there is such a huge support network of other bloggers out there that it’s never lonely. All the other bloggers I’ve come across have been super helpful and really friendly, and there’s always someone to talk to in social media groups. Absolutely anyone can start a blog! You don’t need any special skills or qualifications, you just need to be you. There is only one you and that’s really all you need to be. If you need any help or extra information about anything mentioned please feel free to get in touch with me. Either comment below or email me and I’ll try to help the best I can.